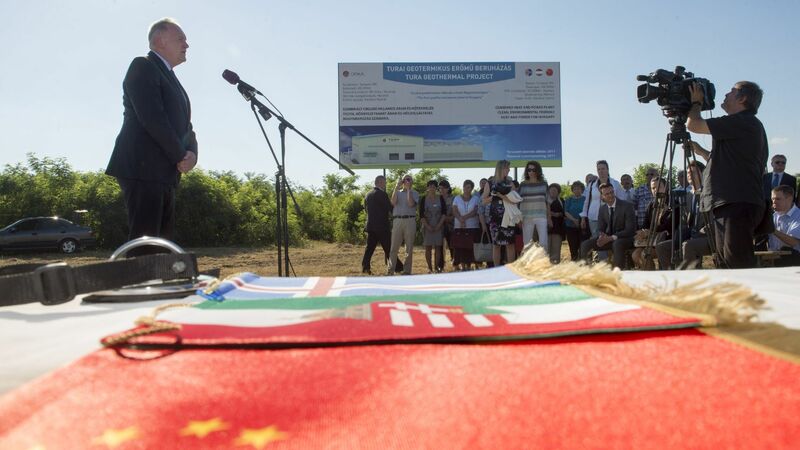 The foundation stone of the first geothermal power plant in Hungary has been laid in Tura, Pest County. Based on Icelandic technology, the project which had been awaiting a capital injection for years — thanks to the contribution from the Hungarian Investment Promotion Agency (HIPA) — was purchased from the Hungarian developers by a Singaporean investor. The Turawell geothermal project is a heat and electricity cogeneration plant which uses geothermal fluid gained from wells to produce electricity and to help heating greenhouses and nearby real estates in an environmentally friendly way. At the end of the cycle, the fluid is pressed back into the geothermal reservoir, enabling the production of environmentally friendly heating and electricity. The technology comes from Iceland where the heating of buildings in 90% is solved through similar technology, that is, geothermal water, and also 99% of power generation is based on renewable energy sources. Eirikur Bragason, CEO of the Singapore-based KS Orca Renewables Pte Ltd (KS ORKA) that purchased a 51% majority stake in the Turawell Kft. said: the company seeks global leadership in the development and operation of geothermal projects, and owns priority investments in Asia and Europe. The target for the next five years is to develop 500 MW of power generation capacity; within the framework of this, the Turawell project is an important first step towards achieving the company's goals in Hungary.